Cengage Learning provides comprehensive high school mathematics courses in print and eBook formats. Courses include Mathematical Models with Applications, PreCalculus with Limits, and PreCalculus with Limits: A Graphing Approach. 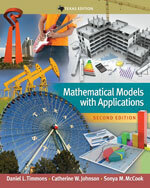 Mathematical Models with Applications begins with a “Chapter R” review of concepts students learned in algebra courses, and then introduces students to the uses of modeling in multiple real-world situations. Instruction addresses functions, graphing, systems of equations, probability, and statistics. Each lessons begins with a short narrative describing content, why it’s important, and how it connects to students’ lives. Informational text uses a conversational tone and is written at a level most high school students will understand. Explanations begin and end on the same page to support readability and comprehension. Important concepts are summarized in textboxes and illustrated in ample example problems that provide step-by-step solutions. The course’s page layout is uncluttered and allows students to focus on examples and easily identify solutions. PreCalculus with Limits addresses concepts from algebra, geometry, and trigonometry in order to prepare students for calculus. The course includes an introduction to calculus and the concept of limits, and its final chapter addresses concepts in statistics. Chapters open with photographs that illustrate the real-world applications of content and references to the chapter examples or exercises to which they apply. Lessons open with clear statements of learning objectives and photographs that help students connect content to everyday experiences. New content is presented with clear, concise explanations and relevant visual elements, such as graphs, photographs, and figures. Explanations begin and end on the same page to support readability and comprehension. Some examples include side-by-side demonstrations of different approaches to solving a particular problem (e.g., graphical, numerical, algebraic). Examples are followed by “Checkpoints” that ask students to solve a similar problem as an immediate check for understanding. PreCalculus with Limits: A Graphing Approach includes instruction in the use of graphing calculators, including “Explore the Concepts” graphing calculator activities and “What’s Wrong?” examples of common mistakes made with graphing utilities.